After 9/11, Nu-Image apparently decided to do their part and make some patriotic movies based on each branch of the military under the banner of the American Heroes Series - Army, Navy, Air Force and Marines. At least we think that was the idea. Unfortunately, these films, while extremely well-intentioned, are without character development and thus you cannot care about what goes on. The exception that proves the rule is Special Forces, which is actually good. The movies are Submarines (2003), Marines, Air Strike (2002) and Special Forces (2003). This time around, in Marines, it seems some, well...Marines are caught behind enemy lines in Chechnya. They must team up with some Russian soldiers to defeat the the enemy. But who can they really trust? Also there's a shipment of gold bars in the mix that are complicating matters for everybody. So out in the field, there's plenty of shooting, explosions, light gore, and gobbledygook dialogue but somehow they couldn't find twenty seconds for even some basic character development. Back at the base, Everett (Cotton - at least we think this is who this is, if we are wrong please tell us) is in some sort of struggle with Mr. Flanders (Hirsch) about protocol or something like that. It's really tough to decipher. What does Mr. Flanders have to hide, if anything? So once again we have a situation, like Submarines, where the actors look like other people, we don't really know their names or backstories, and so interest wanes fast. Speaking of names, when the end credits rolled we were informed there was a main character named "Hamburger" in the movie we just saw. We're pretty sure this was never said once in the movie. Maybe they were worried that would come off as funny. God forbid there would be even a modicum of humor in this overly-serious and unfun production. But yet they had no problem with a character named "Mr. Flanders", which Brant Cotton (we think) shouts over and over again. At least then you can make Simpsons-related jokes. 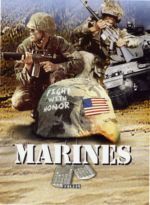 It seems Marines took the movies Saving Private Ryan (1998), Savior (1998) and Behind Enemy Lines (2001) and mashed them all up and hoped for a good result. With a few slow motion sequences and some violence perhaps they were going for some sort of grit, but it takes more than just aping other movies for the audience to get behind what you're doing. 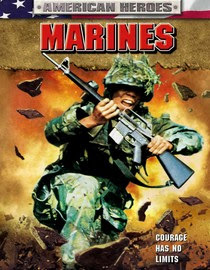 If anything, this movie could be insulting to actual Marines because there are some technical errors with the uniforms and behaviors, and the Marines are primarily portrayed as lunkheads. The practical effect of all this is that Marines comes off as a neo-Vietnam movie, sort of a lost sequel to Eye of the Eagle (1986). Just imagine a Cirio Santiago movie - but not as good! With no real force or energy driving the plot forward, sadly Marines truly is another slog through the woods. I happen to enjoy this movie. It is underrated and offer a lot of glimpse into the careers of marines. Happy you enjoyed it. We thought it was just another Nu-Image slog. Special Forces was good though! Thanks for your comment. We appreciate it.